Facebook is a powerful lead generation source for real estate agents. Don't make the mistake of thinking that noise equals success -- it doesn't. Give them content that answers their questions; you don't have to write it all, just resource it all for them. I watch a real estate agent’s page — I personally know this agent. This agent is paying someone to manage Facebook. The posting is active, as in three or four times each day, which is a good thing. I just checked back on this agent’s page after eight months. The agent stopped posting. In this agent’s opinion, utilizing Facebook business pages doesn’t work, and after you read this article, you’ll know why the page flopped. What’s the biggest problem? There is zero engagement and zero growth — lots of noise, no results. The biggest problem is zero engagement and zero growth — lots of noise, no results. Directions on how followers can see their posts in the news feed — which is great, except that the directions are outdated now. A whole heck of a lot of content that is for everyone except an actual homebuyer or seller. Confusing updates. Who is the page’s target? Why would I want to stay if it’s not about what I thought it would be about when I liked it? The posts themselves are not user-friendly. They aren’t easy to read, and the eyes don’t flow; in other words, people aren’t likely to read beyond the first couple of words. A whole lot of statements with links to articles, but no insight into the page owner or questions for the page followers. Not a single call to action — anywhere. On the page or in posts. A single post with content that points to the agent’s website. More than half of all “likes” are real estate colleagues, not consumers. This Facebook page is essentially useless. It’s a brochure that doesn’t even reflect the agent’s team. It’s a bunch of random, hodgepodge posts — with no direction. The only intent is activity, which is doing absolutely nothing for the agent. It’s not generating engagement. It’s not generating likes — it’s not generating leads. Facebook is a powerful lead generation source for real estate agents. Don’t make the mistake of thinking that noise equals success. It doesn’t. Who is your niche? Buyers and sellers. Are you even more specialized? Historic districts, condos, golfers — you need content that appeals to them but has a real estate or lifestyle focus. If you want to work with historic homebuyers and sellers, you need to give them historic home content. It doesn’t have to be focused solely on your geographic area; share historic home tours from all over the world — social media users love this. Share links to articles about your local historical society. Immerse them in the historic lifestyle — that’s why they are buying a historical home. Whether or not they can think of them right now, your niche has questions. Give them content that answers their questions. Again, with historic homebuyers and sellers, what questions do they have? Do they know how to get a home on the National Register of Historic Places? Do they have questions about research, historical styles or historical colors? Do they have questions about repair and maintenance of historic homes? Give them content that answers their questions. You don’t have to write it all, just build a resource for them. Give them content that answers their questions. You must show you are someone they can trust — period. You do this by sharing your knowledge. Do you participate in your local historical society? Write about pieces and elements they should know that you’ve learned from this society. Have you done research on a particular piece of history in your community? Write about it and share it. Is a registered historical home sale different than a traditional home sale? What pieces are different? Write about them. Get tours of local historical homes, interview the owners, take pictures and give virtual tours on your blog. Get tours of local historical homes, interview the owners, take pictures, and give virtual tours. Don’t just tell people to call you if they are interested in buying or selling a home. That’s a lame cop-out for doing any real work to gain their trust. Do you think that’s a strong statement? Think about it. You’ve made zero effort to figure out who they are and give them a reason to trust you. Write a solid, detailed article on selling a historical home in your area, and then push it out on Facebook. Use a call to action that shows them you are here to help, whether they want to sell now or later. Don’t say you are here to help; show it. It will take more than one article to show your expertise — you’ve got to show it over and over and over. Don’t say you are here to help, show it. It will take more than one article to show your expertise. This is a biggie, and it’s so incredibly simple. Your posts should have many paragraphs with no more than one or two sentences per paragraph. Make it insanely easy for people to read your posts — keep them quick, to the point and scannable, easy to read. Make your posts insanely easy to read — keep them quick, to the point and scannable. We are overwhelmed today — modern life is sensory overload. Make it so easy for people to “see” you that it’s almost a relief for their eyes (and their minds) to partake in what you are sharing with them. Don’t fall for the post type du jour. Don’t do it. Every day, you’ll see some expert or another stating that some type of Facebook posting is dead, so you should do some other type instead. It’s a trap. In a vicious cycle, Facebook catches on (rather quickly) when you try to “game” its system. So what’s the best thing you can do? The best type of post you can put on Facebook is a healthy mix of image posts, link posts, text posts and native video posts. The best posts on Facebook are a healthy mix of images, link posts, text posts and native videos. A healthy mix is essential. Don’t favor one over another. For example, right now, as of the writing of this article, native video posts are getting the most reach. However, photo quotes and text questions are getting the most shares and comments. The question is, which one is better? The answer is they are all better. You need a healthy combination of all types of posts to get as far out into as many of your page fans’ news feeds as possible. 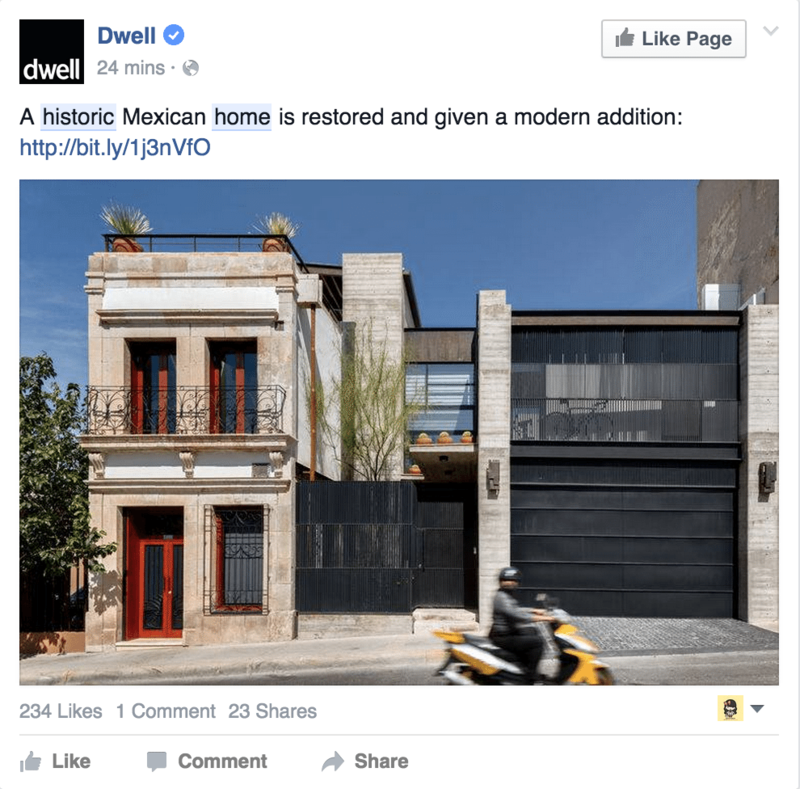 Getting niche-specific “likes” is where real estate agents fail — and fail big. Getting niche specific likes is where real estate agents fail — and fail big. We agents have fallen hard for the line, “Any and all exposure is the best thing since sliced bread.” We think that more exposure means more business. It’s all a big fat lie. Don’t do the shotgun, hope-marketing approach in your real estate business. You want to hit your target every single time, and you want to do it with guaranteed results. Facebook page “likes” are the foundation to your targeting on Facebook, which means you want them highly targeted. You want them to be people in your market who are most likely to buy or sell. That does not mean you want local colleagues to “like” your page. It does not mean you want “likes” from colleagues around the country (in hopes that you’ll get a referral). Stop focusing on the 80 percent that doesn’t bring you business and focus on the 20 percent that does. Get your page “likes” targeted. Get local people connected with your page. Noise is just noise and has no benefit. Stop making noise and start providing value. It’s that simple. Noise is just noise and has no benefit. Stop making noise and start providing value. If you are overwhelmed, there are resources out there; just be careful which resources you pick to use. Use resources that deeply understand the real estate industry, that have a knowledge of Facebook beyond anyone you’ve ever met and that want to see you dominate your area. Download a free Facebook page checklist. More Inman articles by Christina. Is social media REALLY just a 'conversation'?